If you are looking for hosted Microsoft Lync and are considering comparing vendors – you might want to make sure you are comparing apples to apples. In many cases – Hosted Lync quotes are quoting Microsoft Lync Standard instead of Microsoft Lync Enterprise and there is a BIG difference. In the instant messaging and presence (or knowing your office team members status) categories – Hosted Microsoft Lync Standard and Enterprise are basically the same. 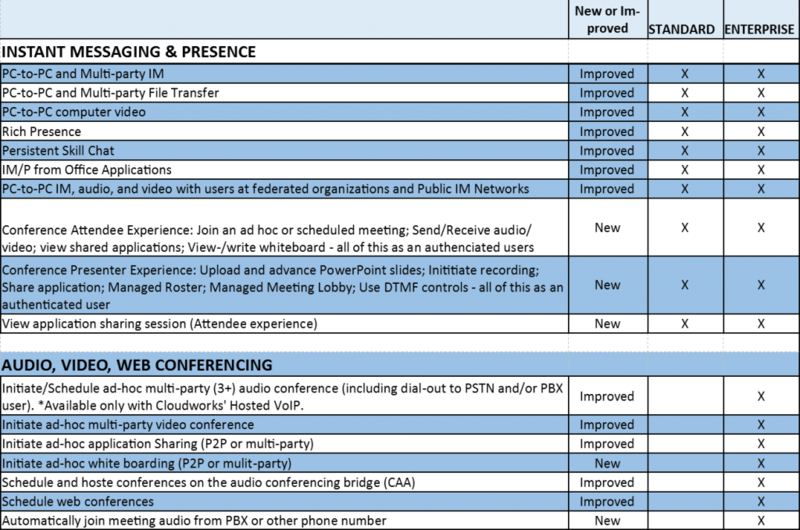 The main differentiators come out when trying to use the Audio, Video and Web conferencing tools. This chart should provide a good overview. The beauty of Hosted Microsoft Lync Enterprise is it truly adds great features and functionality beyond standard. These features warrant extra money that is easily displaced by making your team and your customer interactions much more efficient. They also probably displace some existing costs.